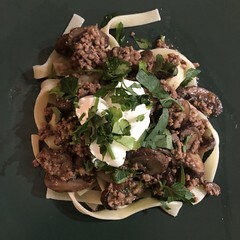 This recipe is a variation on a theme, the theme being stroganoff. While an early iteration omitted onions and mushrooms we decided to add them as we believe they add fantastic flavor. Elena Molokhovets‘s classic Russian cookbook A Gift to Young Housewives gives the first known recipe for Govjadina po-strogonovski, s gorchitseju, “Beef à la Stroganov, with mustard”, in its 1871 edition. The recipe involves lightly floured beef cubes (not strips) sautéed, sauced with prepared mustard and bouillon, and finished with a small amount of sour cream: no onions, no mushrooms. A competition purported to have taken place in 1890 is sometimes mentioned in the dish’s history, but both the recipe and the name existed before then. Another recipe, this one from 1909, adds onions and tomato sauce, and serves it with crisp potato straws, which are considered the traditional side dish for Beef Stroganoff in Russia. The version given in the 1938 Larousse Gastronomique includes beef strips, and onions, with either mustard or tomato paste optional. 1. Sauté the onions, garlic and optional hot peppers flakes on medium sing 1-2 tbsp of olive oil in a dutch oven. 2. When onions begin to show signs of transparency and the garlic begin to soften, add the ground veal, mix well and season with a bit of salt and pepper. Then add 1 tbsp of unsalted butter and . Mix well and let cook for 10 minutes or until sufficiently browned. 3. Add 2 tbsp prepared mustard, mix well. 4. Add the 1/4 cup of Worcestershire along with 1 cup of beef stock and let come to a boil. 5. Add the mushrooms, mix well, cover and let cook for 5 minutes or so. 6. Add another tbsp butter. 7. Once the stock begins to simmer, add another cup of beef stock. 8. Taste and season some more salt and pepper. Taste, taste, taste. 9. Add some Zio’s browning Sauce and flat leaf parsley. 10. Let cook until the gravy is reduced about 50%. 11. Serve with your choice of starch and garnish with fresh flat-leaf parsley.